Standing on the site where Nazis burned 2,000 books by Jewish and Marxist writers, this Parthenon is not made of marble, but of 100,000 books that have been or remain banned by various governmental entities around the world. 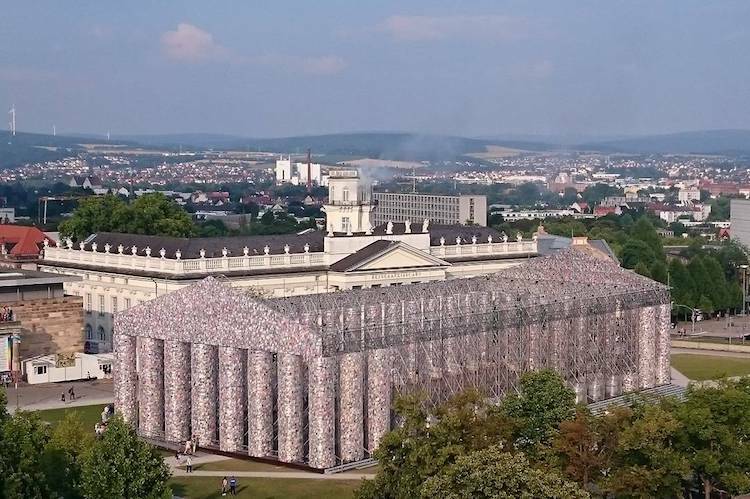 The Parthenon of Books by Argentine artist Marta Minujin faithfully recreates the historic Athens landmark in Kassel, Germany with various editions of 170 banned books, all wrapped in plastic and donated by the public. Why the Parthenon? Because Athens was one of the world’s first democracies and the Parthenon was built as a negotiation between the government and the Athenian public, with each element voted upon. Today, it stands as a potent symbol of democracy itself. Minujin aims to make a statement about censorship. The titles include Mark Twain’s The Adventures of Tom Sawyer, the Kite Runner by Khaled Hosseini, Salman Rushdie’s The Satanic Verses, Cecily von Ziegesar’s Gossip Girl, Harry Potter and the Sorcerer’s Stone and George Orwell’s 1984. 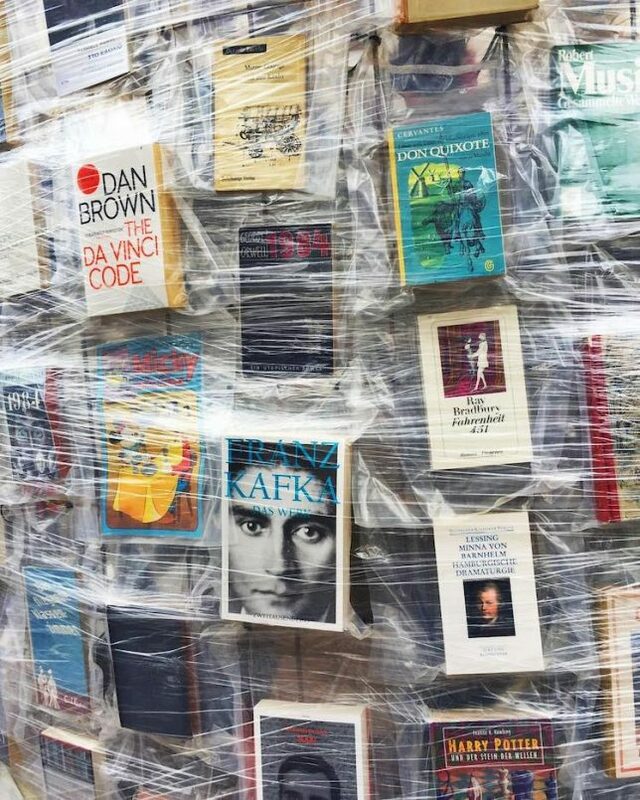 The books are wrapped around a metal frame like a shingled facade with their covers visible, proving that despite efforts to keep their contents from the public, they have endured. 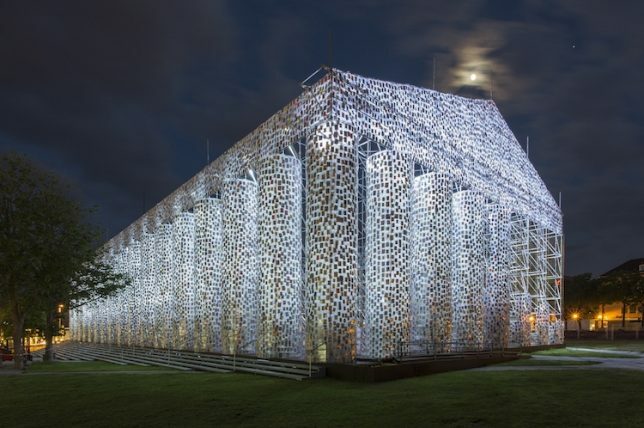 The Parthenon of Books was erected as part of the Documenta 14 art festival, and maintains the same dimensions as the original. It’s also the second time Minujin has installed the piece; in 1983, she erected a similar installation of books to condemn censorship imposed by the military dictatorship after the falling of the junta in her home country of Argentina. 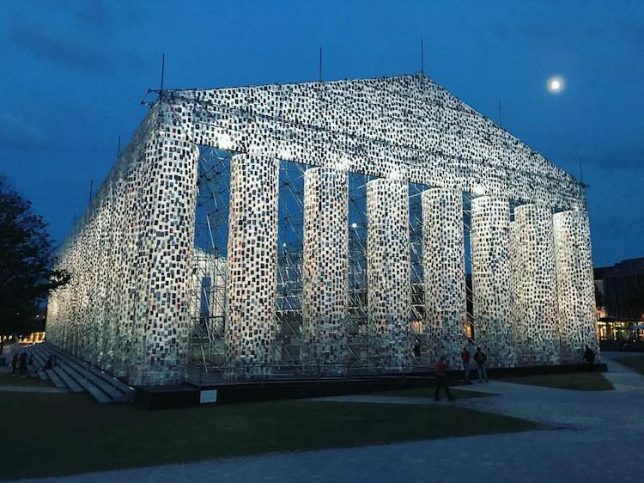 The artist will keep accepting copies of the banned books and adding them to the structure until Documenta ends on August 4th, and then the books will be distributed to anyone who wants them.